For other uses, see Sago (disambiguation). Sago /ˈseɪɡoʊ/ is a starch extracted from the spongy centre, or pith, of various tropical palm stems, especially that of Metroxylon sagu. It is a major staple food for the lowland peoples of New Guinea and the Moluccas, where it is called saksak, rabia and sagu. The largest supply of sago comes from Southeast Asia, particularly Indonesia and Malaysia. Large quantities of sago are sent to Europe and North America for cooking purposes. It is traditionally cooked and eaten in various forms, such as rolled into balls, mixed with boiling water to form a glue-like paste (papeda), or as a pancake. Sago is often produced commercially in the form of "pearls" (small rounded starch aggregates, partly gelatinized by heating). Sago pearls can be boiled with water or milk and sugar to make a sweet sago pudding. Sago pearls are similar in appearance to the pearled starches of other origin, e.g. cassava starch (tapioca) and potato starch, and they may be used interchangeably in some dishes. The name sago is also sometimes used for starch extracted from other sources, especially the sago cycad, Cycas revoluta. The sago cycad is also commonly known (confusingly) as the sago palm, although this is a misnomer as cycads are not palms. Extracting edible starch from the sago cycad requires special care due to the poisonous nature of cycads. Cycad sago is used for many of the same purposes as palm sago. The fruit of palm trees from which the sago is produced is not allowed to ripen fully. The full ripening completes the life cycle of the tree and exhausts the starch reserves in the trunk to produce the seeds. It leaves a hollow shell and causes the tree to die. The palms are cut down when they are about 15 years old, just before or shortly after the inflorescence appears. The stems, which grow 10 to 15 metres high), are split out. The starch-containing pith is taken from the stems and ground to powder. The powder is kneaded in water over a cloth or sieve to release the starch. The water with the starch passes into a trough where the starch settles. After a few washings, the starch is ready to be used in cooking. A single palm yields about 800 pounds (360 kilograms) of dry starch. Sago logs is ready for processing in Kampung Medong, Sarawak, Malaysia. The sago palm, Metroxylon sagu, is found in tropical lowland forest and freshwater swamps across Southeast Asia and New Guinea and is the primary source of sago. It tolerates a wide variety of soils and may reach 30 meters in height (including the leaves). Several other species of the genus Metroxylon, particularly Metroxylon salomonense and Metroxylon amicarum, are also used as sources of sago throughout Melanesia and Micronesia. Sago palms grow very quickly, in clumps of different ages similar to bananas, one sucker matures, then flowers and dies. It is replaced by another sucker, with up to 1.5 m of vertical stem growth per year. The stems are thick and are either self-supporting or have a moderate climbing habit; the leaves are pinnate. Each palm trunk produces a single inflorescence at its tip at the end of its life. Sago palms are harvested at the age of 7–15 years, just before or shortly after the inflorescence appears and when the stems are full of starch stored for use in reproduction. One palm can yield 150–300 kg of starch. Sago is extracted from Metroxylon palms by splitting the stem lengthwise and removing the pith which is then crushed and kneaded to release the starch before being washed and strained to extract the starch from the fibrous residue. The raw starch suspension in water is then collected in a settling container. The sago cycad, Cycas revoluta, is a slow-growing wild or ornamental plant. Its common names "sago palm" and "king sago palm" are misnomers as cycads are not palms. Processed starch known as sago is made from this and other cycads. 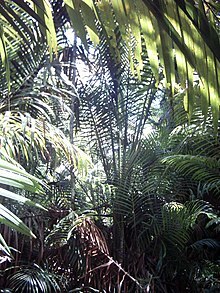 It is a less-common food source for some peoples of the Pacific and Indian Oceans.- Unlike metroxylon palms (discussed above), cycads are highly poisonous: most parts of the plant contain the neurotoxins cycasin and BMAA. Consumption of cycad seeds has been implicated in the outbreak of Parkinson's disease-like neurological disorder in Guam and other locations in the Pacific. Thus, before any part of the plant may safely be eaten the toxins must be removed through extended processing. Sago is extracted from the sago cycad by cutting the pith from the stem, root and seeds of the cycads, grinding the pith to a coarse flour, before being dried, pounded, and soaked. The starch is then washed carefully and repeatedly to leach out the natural toxins. The starchy residue is then dried and cooked, producing a starch similar to palm sago/sabudana. The cycad seed should not be eaten as it remains highly toxic after washing. In Brazil, sago is extracted from cassava root, in what is known in English as tapioca pearls. It is usually mixed with wine and then served as a pudding dessert called "sagu de vinho." Sago starch can be baked (resulting in a product analogous to bread, pancake, or biscuit) or mixed with boiling water to form a paste. It is a main staple of many traditional communities in New Guinea and Maluku in the form of papeda, Borneo, South Sulawesi (most known in Luwu Regency) and Sumatra. In Palembang, sago is one of the ingredients to make pempek. In Brunei, it is used for making the popular local cuisine called the ambuyat. It is also used commercially in making noodles and white bread. Sago starch can also be used as a thickener for other dishes. It can be made into steamed puddings such as sago plum pudding. In Malaysia, the traditional food "keropok lekor" (fish cracker) uses sago as one of its main ingredients. In the making of the popular keropok lekor of Losong in Kuala Terengganu, each kilogram of fish meat is mixed with half a kilogram of fine sago, with a little salt added for flavour. Tons of raw sago are imported each year into Malaysia to support the keropok lekor industry. In 1805, two captured crew members of the shipwrecked schooner Betsey were kept alive until their escape from an undetermined island on a diet of sago. Any starch can be pearled by heating and stirring small aggregates of moist starch, producing partly gelatinized dry kernels which swell but remain intact on boiling. Pearl sago closely resembles pearl tapioca. Both are typically small (about 2 mm diameter) dry, opaque balls. Both may be white (if very pure) or colored naturally grey, brown or black, or artificially pink, yellow, green, etc. When soaked and cooked, both become much larger, translucent, soft and spongy. Both are widely used in Indian, Bangladeshi and Sri Lankan cuisine in a variety of dishes and around the world, usually in puddings. In India, it is used in a variety of dishes such as desserts boiled with sweetened milk on occasion of religious fasts. In India, "Tapioca Sago" is considered an acceptable form of nutrition during periods of fasts for religious purposes or for infants or ill persons. In the UK, both sago and tapioca have long been used in sweet milk puddings. In New Zealand, sago is boiled with water and lemon juice and sweetened with golden syrup to make lemon sago pudding. In India, Tapioca Sago is used mainly to make the food items like "Kheer","Khichadi", "Vada" etc. Because many traditional people rely on sago-palm as their main food staple and because those supplies of these are not unlimited, in some areas commercial or industrial harvesting of wild stands of sago-palm can conflict with the food needs of local communities. ^ Karim, A. A. (2008). "Starch from the Sago (Metroxylon sagu) Palm Tree—Properties, Prospects, and Challenges as a New Industrial Source for Food and Other Uses". Comprehensive Reviews in Food Science and Food Safety. 7 (3): 215–228. doi:10.1111/j.1541-4337.2008.00042.x. ^ "Sago Pudding with Palm Sugar (Sago Gula Melaka)". mycookinghut.com. 2010-05-23. Retrieved 9 March 2011. ^ "Plant toxin-induced liver damage - Cycasin". Health Grades Inc. Retrieved 28 December 2009. ^ Sacks, Oliver (1996). The Island of the Colour-blind and Cycad Island. Picador. pp. 109–226. ISBN 978-0330350822. ^ Whiting, Marjorie Grant (October 1963). "Toxicity of cycads". Economic Botany. 17 (4): 270–302. doi:10.1007/BF02860136. ^ "Sagu de vinho tinto (Tapioca Pearls in Red Wine)". Retrieved 2019-03-19. Rauwerdink, Jan B. (1986). "An Essay on Metroxylon, the Sago Palm". Principes. 30 (4): 165–180. Lal, J. J. (2003). "SAGO PALM". Encyclopedia of Food Sciences and Nutrition. pp. 5035–5039. doi:10.1016/B0-12-227055-X/01036-1. ISBN 9780122270550.